I was hoping that this ungainly creature was a Spinach moth - not that they're rare or anything but it's such an intriguing name for an insect which has no obvious connection with Popeye and whose caterpillars feed exclusively on red and blackcurrant. They are at least green, with white lines, so perhaps that's the explanation. I shall browse on Google. However, this isn't a Spinach but a Barred Straw, the only British moth to rest with its wings stretched out at what looks like an uncomfortable angle. It's common too but I haven't recorded it here before, so that's another one for my next list revision, along with the Short Cloaked, that oddity the other day which I compared to Moses on Pisgah. 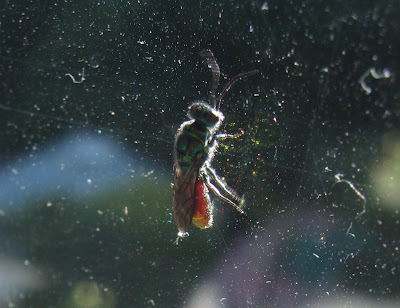 Yesterday's intriguing beast turns out, as per kind and much-appreciated Comments on the post, to be a Ruby-tailed Wasp. 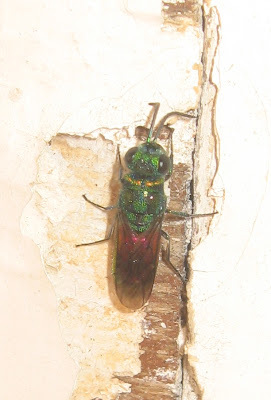 It is a lot less nice than its name suggests, cuckooing its larvae into the nests of other solitary wasps and bees, where they eat their hosts. I never feel happy when the term 'un-natural' is applied to various undesirable or unpopular forms of human behaviour. Nature is awash with undesirable goings-on. But here's a sweet little Single-dotted Wave to end on a positive note. Its behaviour is as demure as its appearance suggests. Some pretty moths fluttered in last night, with pleasant weather continuing. If you are taking your UK weather reports from Wimbledon, you'll have the wrong impression of what it's been like in Yorkshire. Lovely and sunny, albeit quite a lot cooler and fresher at night than it was over the humid, sub-tropical weekend. The rainstorms only affected London and the south-east; and I'm glad to say that the radio has just chirruped: "It's a beautiful morning in Wimbledon." Hooray! Anyway, I'm putting the moths on hold 'til tomorrow, to show you my interesting flies. People often raise an eyebrow when they discover you're interested in moths (soon lowering it, though, and enquiring about Watkins & Doncaster, entomological suppliers, after you've explained the fascination and beauty...) But flies? Well, just have a look at these pictures, of what to the eye was a glinting but otherwise small and annoyingly buzzy speck trying to get out of our bedroom window. They almost make me want to be a dipterist, specially the one at the top which has some of that lonely appeal of ET - a small creature alone in a vast universe... How about you? If anyone knows what this is, needless to say, I'd be delighted to know. Update: see excellent Comments - it's the lovely-sounding Ruby-tailed Wasp. 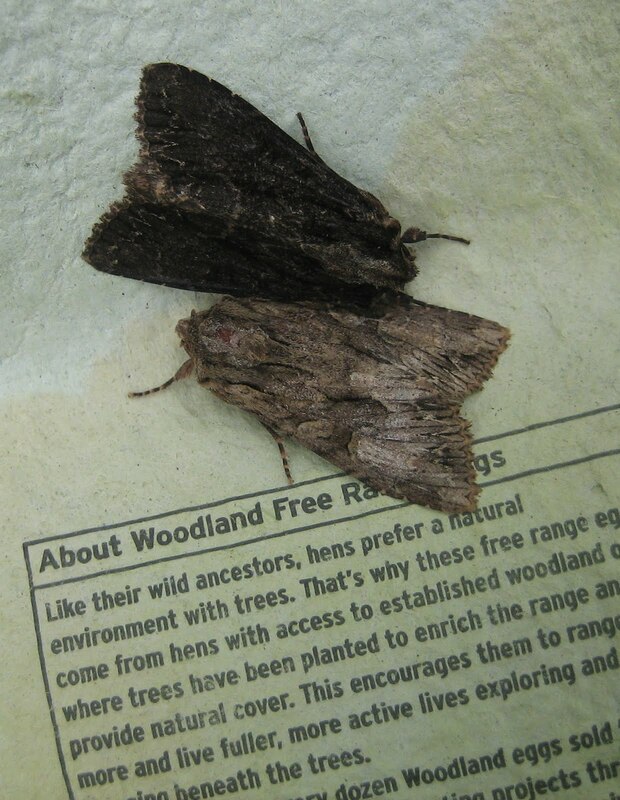 A couple of mediaeval-sounding moths arrived last night. The Grey (or Dark) Dagger and the Gothic could well feature in one of the Waverley novels or a poem by Edgar Allan Poe. Both perhaps fall into the smallish brown and grey moth category, from which arrivals such as yesterday's Ghost moth are such welcome exceptions; but their wing patterns are lovely and explain their names. Here's the Gothic in better focus, left, showing its intricate arches, like a church window. I say 'Grey or Dark' for the Dagger, incidentally, because the species are indistinguishable unless you examine their genitalia, which I don't plan to do. The pair were among at least 20 moths which didn't actually enter the trap but settled on grass and plants round about and went to sleep there. A lot of moth recorders spread a white sheet under and around their traps and these seem to attract arrivals in the same way that a nice big bed with clean sheets does me, when I'm whacked. I saw this in action when I went trapping in North Yorkshire with Charlie Fletcher & Co in April for the Radio 4 programme Requiem for a Moth. It was impressive, but I haven't negotiated a sheet from our airing cupboard with Penny yet. Meanwhile, here are some of the near-trap loiterers - pictures in order from top to bottom of the post: a Swallowtailed moth, the first of the season here but already a bit ragged; a Canary (one of a pair), a Light Emerald, a Riband Wave and a Clouded Border. There were also half-a-dozen other Light Emeralds, two Common Footmen and a Small Mottled Beauty and altogether it was a pretty sight. Charlie has been emailing me kindly to identify moths, and says that he had 101 different species in his trap at Ripon the night before last. These are indeed the high days for UK moths. I was going to tell you about a fascinating fly on our bedroom window last night, but this handsome creature appeared in the trap this morning and scooped my plan. 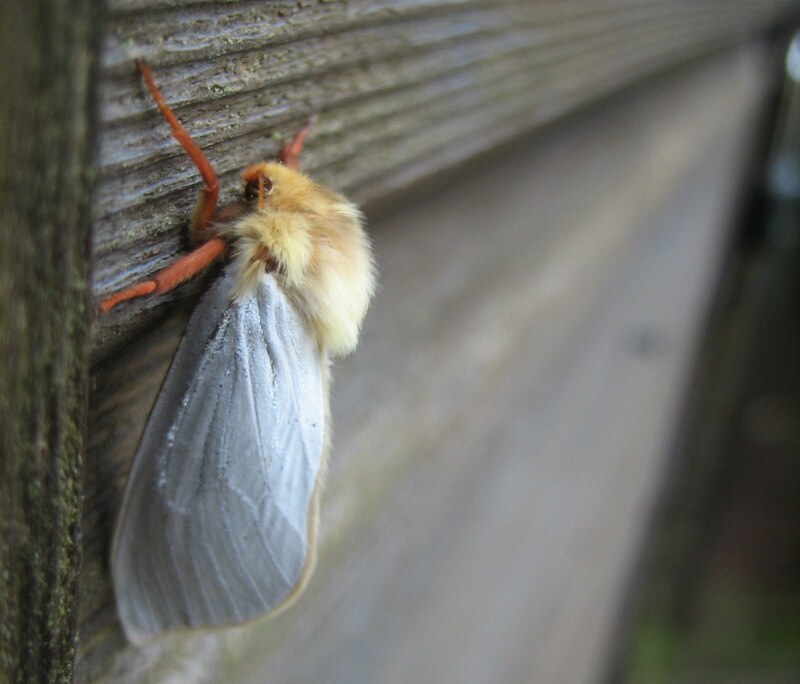 It's a Ghost moth, well-named for obvious reasons, although the females have a different, buttery-streaked-with-orange livery. Actually they look like those novelty Wensleydale cheeses dotted with odd fruits which they make now at the 'Wallace and Gromit' creamery in Hawes. The male here is more of a slice of camembert, although his underside is quite different. My specimen was very sleepy and so quite co-operative. I'm sorry not to have got the focus dead-on, but here he is from below; a sort of mushroom grey. 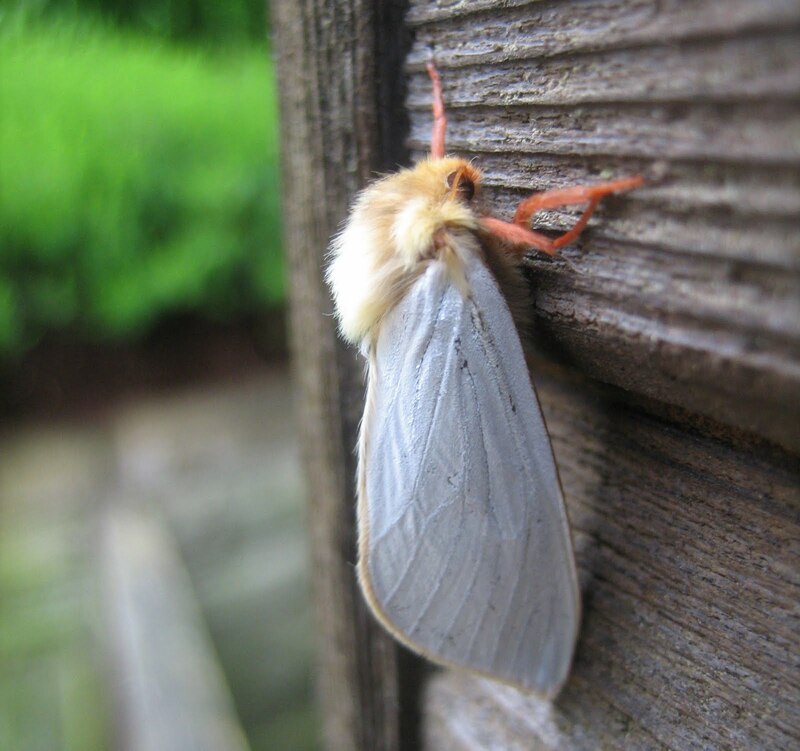 The Ghost adds a distinctive word to the vocabulary of moths: lekking. This is the term used for the male's distinctive habit of fluttering over one spot with a pendulum-like action, sometimes in numbers, while releasing a powerful pheromone scent. Powerful is the word because although it smells like goat, the effect on females is so overwhelming that they sometimes fly straight at the male and both tumble to the ground. There they get on with it, according to my moth Bible from which I am taking all this on trust. It adds, "mating pairs are conspicuous on low vegetation by torchlight." This reminds me of footnotes in my school Shakespeare by an American academic called Kitteridge whose ability to detect naughty meanings in the text knew no bounds. He enlivened many a dull lesson and I hope he still appears in the editions they use today. I'll just end with a moth-in-motion pic - sorry, inevitably blurred again, but I wanted to see if the hindwings were white too and I had such a co-operative moth. They are. I don't want to be disrespectful, specially on a Sunday, but this tiny scrap of a moth immediately made me think of Moses on Pisgah, or at least a priest or vicar about to address the congregation. 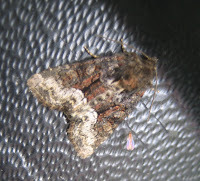 I had hoped that it might be a macro moth but unless it's a strongly-coloured Small Marbled, I think it's going to join the list of micros awaiting identification in my retirement (though thanks to Steve T in a comment on yesterday's post for tracking another of them down. Much obliged). Doesn't it have a fine, aristocratic nose? And that tawny micro must be Joshua, nipping back down the mountain to tell the Children of Israel. These moths are about half as long as a grown-up's fingernail, but you can see the beauty of their colouring and patterns in the view to the right, taken after I caught the eggbox with my dressing gown (checking the trap is an early morning, pre-tea job so long as I have the willpower to get up). It fluttered down from Pisgah but fortunately settled. I was less lucky with a beautiful Brown China Mark micro, one of the loveliest and largest of the common ones, which skimmed away. Talking of beauty, this next moth is a delight to see, albeit common enough. It's a Marbled Beauty which obligingly went to sleep for the night close to a Peppered moth (below, bottom of post) which has a similar swatch of soft and gentle colours. There were a lot of other arrivals, although not a record for the year, in spite of the very warm temperatures. Apparently we may enjoy a brief heatwave this weekend. Bring it on. Just a reminder btw that you can single-click on any of these pics to make them bigger. Anyone from Leeds has to like a moth called the Dark Arches. The same name belongs to one of the spookiest parts of our city where the river Aire turns into the Styx and winds beneath the City Station in a labyrinth of brick-lined tunnels. It's been titivated in recent years and renamed Granary Wharf but the old name persists. Rather as when the Guardian's former Northern Editor Harry Whewell was rung up to be told that in future Manchester's famous Midland Hotel would be known as the Majestic Renaissance Midland, or whatever, and replied laconically: "Not by me it won't." There are a lot of 'arches' moths, so called because of patterns on their wings and, to annoy inept identifyers such as myself, they often vary considerably within individual species. Thus this pair, enjoying a rather uplifting essay about free range hens in their eggbox, are both Dark Arches. The really dark one is the melanistic version, still found quite frequently in formerly dirty industrial areas where natural selection favoured its camouflage. It's known as the form Aethiops, a lovely word which brings to mind that Shakespearian tag: "It seems she hangs upon the cheek of night, as a rich jewel on an Ethiop's ear." Eeh, he had a silver tongue, that Romeo. It's been a catch of pairings, too. Here's one of the first Dun-bars of the season with a micro, almost invisible in the gloomy, Dark Arches-like recesses of the eggbox cone at the right of the picture. I haven't identified that yet and may never do so. And, below, a pretty little Marbled Minor with a minute companion and its slip showing. Veritably a moth Juliet. A whole squadron of Light Emeralds overnighted here last night. They were waking up when I arrived with my camera and most of them scrambled and flitted off into our holly hedge before I could sort myself out. This one briefly crash-landed in the grass, however, and gave me enough time to do these top and bottom shots. Sorry the antennae are blurred, but you can scroll down to yesterday's post to see one in focus. Less lively was this Clouded Border, a sweet little visitor which was on the outside of the plastic cowl and didn't want to leave even when I gently blew it off into the safety of the hedge. And lastly, here's a fine example of the ladies' fur coat brigade of moths, the Slender Brindle. Charlie Fletcher (see post below again for the benign effects of his moth learning) calls these Brenda Slindles. Watch out for that name in my popular novel, should I ever manage to write it. 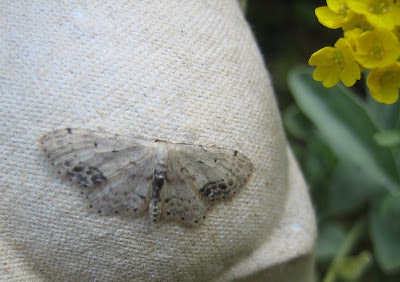 After screwing my eyes up and holding the picture every which way, I think that this one is a Small Engrailed. Actually there were two, in another well-filled trap this morning. The one at the top of the post posed placidly with its wings out, showing a pattern which makes excellent camouflage on most tree trunks. The other one was extremely frisky and only briefly paused in the long grass before fluttering away. Flutter is the right word for these delicate, relatively large-winged moths, rather than the US drone-style approach favoured by their chunkier, fat-bodied colleagues such as the yellow underwings or the Dark Arches. Their beautiful antennae help them in flight and I have zoomed in on one. I wish humans had antennae. Maybe evolution will given them to us, one day. Let's wave at the Waves, a pretty family of moths whose arrival signals pleasant things such as the summer solstice, midsummer's day and the like. I was too sleepy to take much note of the shortest night of 2011, but the moths were certainly out enjoying it. It was drizzling this morning but the trap contained several hundred slumberers, including two Elephant Hawks, two Green Arches, a nice Buff Ermine and far too many mind-taxing brown and grey characters. 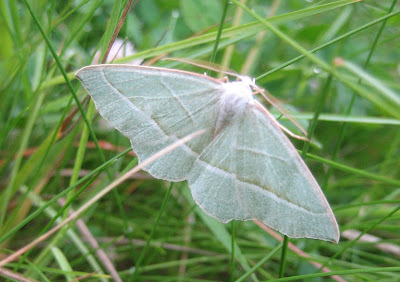 The waves are a Single-Dotted and a Riband, at the top and just above. The Single-dotted defies language as it clearly has two dots, as you can see. Maybe I am setting myself up as a twerp by misidentifying it, but I don't think so. Shall we rename it the Double-dotted Wave? There was also the first Angle Shades of the year, a rakish moth and another of those whose striking wing shape must surely have influenced or at least intrigued aircraft designers. I remember my Mum ringing me up in excitement a couple of years ago when she found one below her porch light and wondered what it was. It would be interesting to see one fly and compare its actions with the mad jerkings of the Large Yellow Underwing. Maybe, one day, when I've got more sophisticated filming techniques. Finally, can any of my expert readers tell me what on earth this is? An aberration? Or something brown, grey and boring which has met with a flying accident? I had the trap out all ready yesterday evening because it was lovely and warm. But as night fell, so did the rain. I was saved, in terms of having something to post, by my brother-in-law who came for a weekend walk with us and showed me this moth caught in a bowl of gypsophila on top of his TV. It took some disentangling but here it is; dull to look at but quite an interesting insect. It's a Bee Moth, notable for having one of the few carnivorous caterpillars found among UK species. They live as guests in wasps and bees' nest (though not commercial hives) and then ungratefully turn on the wasp or bee larvae when they are big enough to subdue and eat them without a fight. Yuk. The adults don't go in for any of this sort of thing, though. Those secateur-style nippers they have on their heads (as visible below during the moth's getaway) are palps, sensitory organs as recently described in a post on the Snout moth. The Bee moth is also interesting in that the females have (slightly) brighter and more interesting wing-colour and patterning than the extremely boring males, such as this one. It's usually the other way round. A lesson in patience this morning. 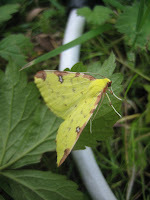 Although the night had been reasonably mild and the light was in a prominent spot, the eggboxes yielded only a score of Heart and Darts, two Large Yellow Underwings and a half-dozen micro-moths. 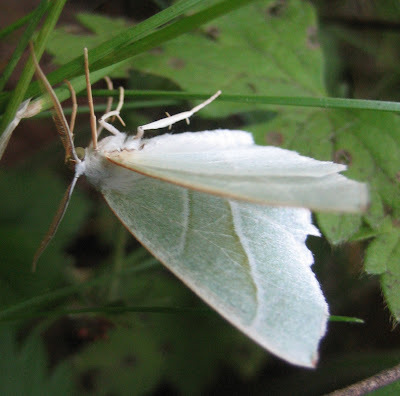 Until the very last box, underneath was perched this Bordered White, notable for pretending to be a butterfly by resting with its wings folded above its back, like all British butterflies, rather than flat-back, like almost all our moths. It will never get away with this, however, because look at those marvellous antennae. No British butterfly boasts anything like that. They all have a simple club shape, one of the other ways that we can tell the two types of insect apart. Mind you, it's only the male Bordered White which boasts these TV aerials. The female would be a better impersonator with her narrow and unadorned - but unclubbed - versions. I guess the difference will have something to do with male detection of females which can take place in moths at impressively large distances. Then I carried out the formality of checking foliage near the trap, something which seldom yields any moths in my experience, probably because I am not a very patient detective. But I promptly spotted this Common Footman, the first of the year, dozing on a leaf of our 'Pineapple' plant, an incredibly vigorous shrub which scrambles up our back wall, multiple-leaved but very sparing in its production of lupin-like yellow flowers. The footman is sparing with its yellow too; from above it looks like its namesake in very sober livery. But this one fortuitously fluttered from its perch and ended up, briefly, upside down, before creeping into a paving-stone crack, below. It is a true Lincolnshire yellow-belly, as you can see. Rain continues to stop play, except indoors. No moths have fluttered inside from the gentle but continuous downpour, but here is (possibly) the great-grandson (or daughter) of Bob, our favourite spider who comes out to watch the News at Ten. The sight of Huw Edwards seems to appeal to the family, as I showed in photos on posts in 2008, of the first post-Bob generation (left), and then last year of a putative grandchild (below, not for the squeamish). I've rather messed up the latest picture by pressing the Enhance button on iPhoto, which turned the colours a bit lurid. I haven't found an Undo button to click, so there we are. Great-grandchild is living currently under the central heating pipes in our kitchen, and makes many bold sallies to help us with our usual vacuuming round. (Isn't that an odd-looking word, vacuum? Though it only comes from the Latin for empty, vacuus). It would be interesting, for the strong-stomached, to compile a list of all the creatures which share our house with us, from mites to bats. I read a book once called The Life that Lives on Man and was suitably appalled. What have you been on?